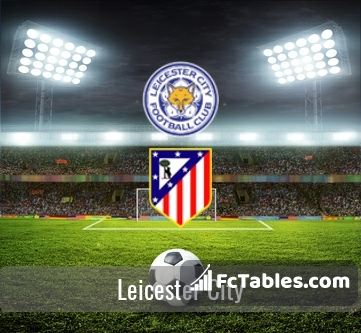 The match Leicester-Atletico Madrid Champions League will start today 18:45. Referee in the match will be Gianluca Rocchi. Leicester takes place, which promoted to the European cups. Last 5 games (league + cup) finished balance 0 points. Players Leicester in Champions League with the highest number of goals: Riyad Mahrez 4 goals, Marc Albrighton 2 goals, Islam Slimani 1 goals. Most assists in the club have: Riyad Mahrez 2 assists, Islam Slimani 1 assists. Injuries in the team Leicester: Molla Wague, Nampalys Mendy. Atletico Madrid takes place, which promoted to the European cups. In 5 last matches (league + cup) team gain 0 points. from 3 matches team have not been defeated. The most goals in Champions League for Atletico Madrid scored: Antoine Griezmann 5 goals, Kevin Gameiro 2 goals, Yannick Ferreira-Carrasco 2 goals. Players with the most assists: Antoine Griezmann 2 assists, Kevin Gameiro 1 assists, Yannick Ferreira-Carrasco 1 assists. In Atletico Madrid not occur in the match due to injury: Augusto Fernandez, Sime Vrsaljko. Direct matches: Atletico Madrid won more direct matches. 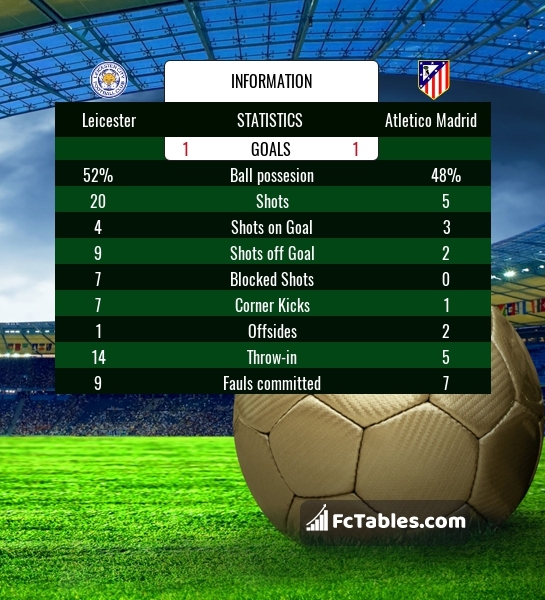 Leicester won 0 matches , Atletico Madrid won 1 direct matches, was a 0 draws. In 0 matches the sum of the goals both teams was greater than 2.5 (Over 2.5), and 0 matches teams scored more than 1.5 goals (Over 1.5). In 0 matches the both teams scored a least one goal (Both teams to score).